Defenition of Top Down Process. The definition of Top Down processing are: Top-Down processing strategy is evoked from a bank of prior knowledge and global expectation and other background information that the listener brings to the text. Top-Down Processing is more concerned with the activation of schemata, deriving meaning, global understanding, and interpretation of the text (Nunan :1989). Top-Down processing strategy is activating prior knowledge to make prediction about the text top-down processing is pre-listening activity which emphasizes to how activate the students prior knowledge. (Ji Lingzhu: 2003:4). Top-Down processing utilizes internal, high-level models of the acoustic environment and prior knowledge of the properties and dependencies of the object in it. In this approach information also flows top-down: a sensing system collects evidence that would either justify or cause a change in an internal world model and in the state of the object in it. This approach is double- called prediction-driven processing, because it is strongly dependent on the prediction of the abstracted internal model, and on prior knowledge of the sounds sources (Ellis :1996). Bottom up processing on the other hand refers to deriving the meaning of the massage based on the incoming language data, from sounds to words, to grammatical relationship, to meaning (Carol, 1997:2). Bottom up processing on the other hand, is text based on which the listener realize on the language in the massage that is the combination of sounds, words, and grammar that creates meaning (Ji Lingzhu, 2003:4). Just like reading, in listening there are also two simultaneous and complementary ways of processing a text. 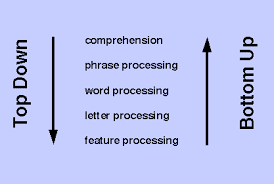 In Top-Down processing, the students use their prior knowledge to make prediction about the text and in Bottom-Up processing, learners rely on their linguistic knowledge to recognize linguistics elements like vowel, consonant, word, sentences, before they understand the general meaning of the passage. However, in practice they often adopt a top down approach to predict the probable theme and then move to bottom-up approach to check their understanding. According to the scheme theory, the process of comprehension is guided by the idea that input is overlaid by the pre-exiting knowledge in an attempt to find a match. The readers must relate textual material to their background knowledge so that the new input from a reading passage is mapped against some prior scheme. All aspects of the previously exiting scheme must be compatible with the input from the text. However, the passage is not about the advertisement for the perfume, but about their though on the ways advertise. The student reported that they did not think about the advertisement planning process while they listened to the passage. Most of the student actually failed because they were not very familiar with the topic. In Top-Down processing, the content scheme must be active in order for the learners to access their prior knowledge. Consequently, it is our job to use classroom activities to help them. First of all, we must assess the students’ level of background knowledge on a particular topic before the students listen of the text. If the students lack specific content scheme. We is should provide a remedial lesson Gained at time to make specific lesson plans for remaindered of the listening lesson on the particular topic. The science of perception and the perceptual model of audition are dominated by a bottom-up approach, most often ignoring top-down flow of information in the human auditory system. In our transcription system, the only top-down mechanism is its use of tone models, i.e., prior knowledge of the instrument sounds. On the other hand, musical knowledge is total ignor, assuming all note combinations and sequences equally probable. The foundation of signal analysis is still in reliable low-level observations. Without being able to reliably extract information at the lowest level, no amount of higher level processing cannot replace the functions of a bottom-up analysis. Instead top-down techniques can add to bottom-up processing and help it to solve otherwise ambiguous situations. Top-down rules may confirm an interpretation or cancel out some other. On the other hand, high-level knowledge can guide the attention and sensitivity of the low-level analysis. It should be noted that top-down processing does not require that the information should have originated at a high-level process. Conversely, all top-down processing should be highly interactive and adapt to the signal at hand. Carol (1997:3) writes “at the same time, two types of cognitive processing are also occurring: top down and bottom up processing. “ Learners need to be aware that both of these processes affect their listening comprehension. Students need to be given opportunities to practice employing each of them. Top Down activities encourage learners to discuss what they already know about the topic and Bottom Up practice activities give confidence in accurate hearing and component of the language. Belum ada tanggapan untuk "LISTENING COMPREHENSION THROUGH THE APPLICATION OF TOP DOWN AND BOTTOM UP PROCESSING"